With an uncomplicated script, a generous smattering of jokes, puns and dances, Little Theatre's pantomime, "Robin Hood Wanted For Good," was enjoyable, writes ELIZABETH ROY. Outstanding performances bolstered by technical support. - Pics. by K.V. Srinivasan. MUSEUM THEATRE closing down for restoration work had Pantomime Producer Ayesha Rau looking for alternative places. 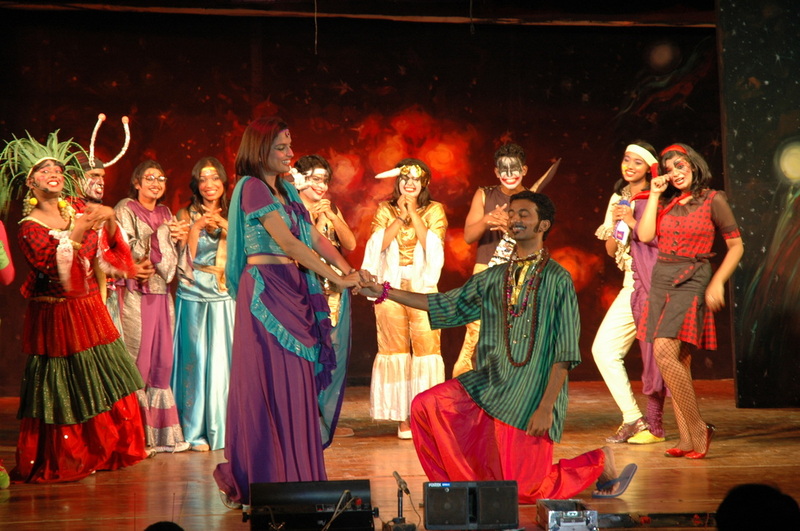 She relocated to the Y.M.C.A Open Air theatre, Nandanam. "Robin hood Wanted for Good" was idyllic, surrounded by grand old trees and far away from the din of the city sounds. It really didn't matter that acoustically the amphitheatre was a near disaster. It didn't matter that the logistics of seating and the steps leading down smacked of the perilous. `The panto' turned out to be a good show, and an evening of wholesome, simple fun. "Robin Hood" was a pantomime, which was put in perspective. Ayesha Rau's script was uncomplicated. Robin Hood and his men and women return to the poor, what the Sheriff-naughty-I-am and his sidekicks had seized from them. Merlin the wizard puts in his two bit help. Maid Marion comes with her twin/ Maid Madonna. The latter is in love with Robin's comrade Rayban who is temporarily blind because he had chosen the wrong pair of glasses. Little John who is on overdrive is quite drawn to the dynamic, bottle wielding Sister Tuck. Then there is a wicked witch with a gorgeous cauldron from the local kalyanamandapam. A chaiwala a-la-mode Rajnikanth. All the Little Theatre, small children, as the most loveable of flowers and scampering little creatures of the forest. How can one forget the Adult Tree (adultery) around whom all the naughty things happen. There was a generous smattering of jokes and much punning and good dancing. 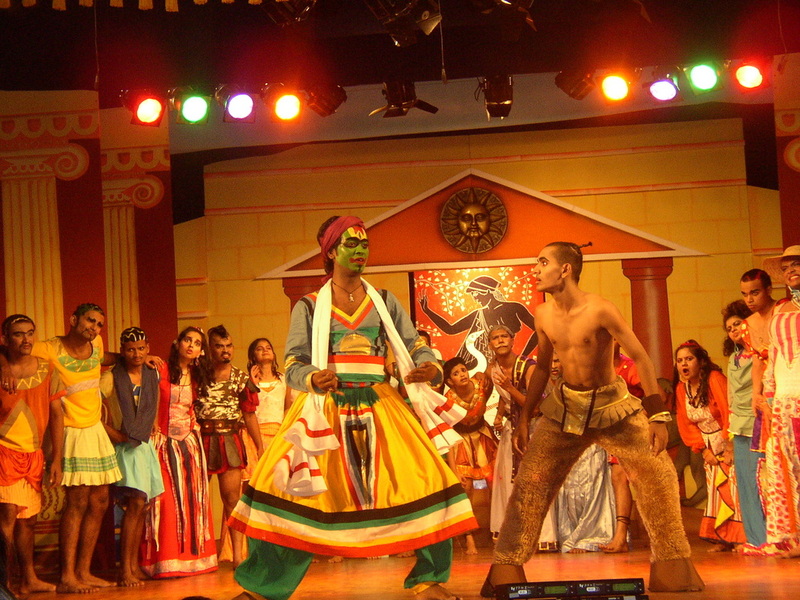 The show also had its share of some outstanding performances. Sheethal Govindan as Sister Tuck was perfect. She sang like a dream, she danced like a reed and using the two she showed the steel that makes the woman. It was difficult to look at anybody or anything else when she was on stage. Shakila's Polly the parrot was another amazing act. It was a perfect example of body language communicating the essence of the character. Vidyuth Sreenivasan as Madonna gave a very played down version of the Dame. He was dressed like his sister (Andrea Jeremiah), moved like his sister, was more fetching and beautiful than his sister, that the audience forgot that they were skipping beats over a very talented young man who is passionate about weight training and body building. Then there were two very good performances from the directors R. Sunder (Rayban) and Freddy Koikaran (Sheriff). Another delightful performance was from Manoj Nair (Little John). The audience loved him for his good singing and the agility and lightness he managed to bring to his big frame. Another good performance came from his companion Will Scarlet, Nikhil Rolla. Mention must also be made of the spectacular job from the witch, Megha Rajan. All this talent would have gone unnoticed, had the technical support been any less. A well-pleased Mithran Devanesan who designed sets and lights swears the Y.M.C.A theatre is a lighting designer's worst nightmare. In the absence of lighting bars, he had to use the awesome trees that rise into the firmament. The result was stunning and classy — particularly the rainbow dome he had created out of the canopy of trees that hung over the stage. His stage design was just as stunning. He focussed on the many bits of wall that back the stage and simply painted on them the lovely foliage and flowers of the forest in delightful shades which were picked up by the costume designers — the graduating class of NIFT, Chennai. They had done an amazing job, taking care not to let the design overshoot the show. Polly's outfit stood out as a masterpiece. The makeup team headed by Shamshu was great and showed much creative imagination. Music again was good and much of it was rap — as a result one didn't get as much of Sunita Choudry as one would have liked. There were some natural touches, which added so much to the pantomime spirit — like a totally bewildered local dog that strayed onto stage. With great dignity and calm she tried every exit and finally (cheered on by the audience) found her way out. Then there were all those little, little people who drunk on music and rhythm danced their way to the stage. If only the embarrassed mothers had not pulled them away!! There was also a touch of Brechtian Alienation, when Jairaj Rau (Producer's husband and chief supporter) stopped the show to make an announcement "The cash box with a lot in it is missing. Has anyone here taken it as a prank? Security has been alerted, your bags will have to be searched!!" It was hilarious to watch the Governor's personal security going into a double take. One impatient man hollered, "OK yaar let's get on with the show." Another whooped in reply, "Machan this is the show!!" 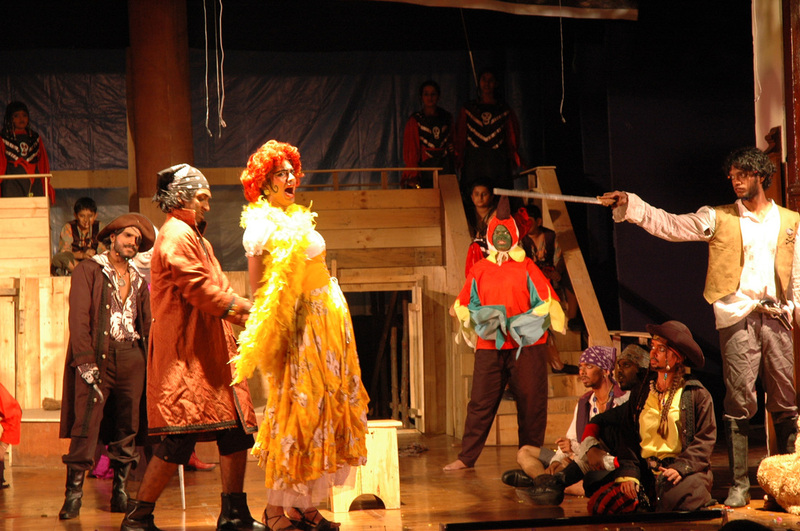 Film Star Mirchi Shiva as Babu in the 2002 Christmas Pantomime :Robinhood wanted for good! 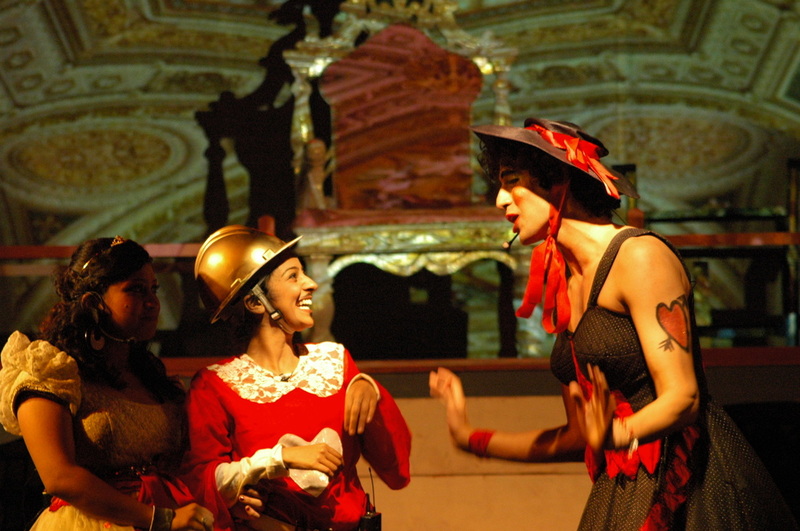 Andrea Jeremiah as Maid Marion with Divya as Robinhood in the Christmas Pantomime: Robinhood wanted for good!